Doctors Explain How Faulty Meta-Analyses Can Harm Public Health...Other tainted systematic reviews and meta-analyses have been used to make cholesterol, tropical oils, and overweight appear benign, serving the interests of the food industry. Controversial headlines proclaiming “butter is back,” “being a little overweight is good for you,” “cholesterol is safe,” and the like may be the product of faulty research, according to a JAMA exposé released Sept. 18, 2017. The JAMA article, by Physicians Committee president Neal Barnard, M.D., F.A.C.C., with Walter C. Willett, M.D., Dr.P.H., and Eric L. Ding, Sc.D., both from the Harvard T.H. Chan School of Public Health, targets meta-analyses, large studies that can be misused, potentially duping the press, public, and policymakers about foods and serving the interests of the food industry. Meta-analyses combine the results of previous studies to come to an overall conclusion about a research topic. However, several factors—such as the inclusion of poor quality studies and combining widely dissimilar studies—can lead to misleading results. 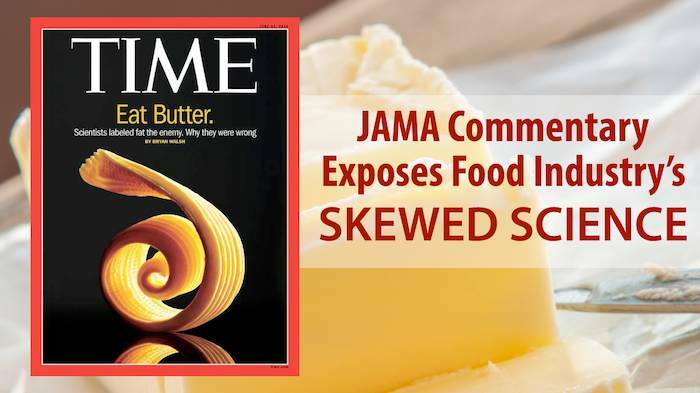 The commentary describes a 2014 Time magazine cover that featured a swirl of butter with the headline “Eat Butter.” The Time article was based on a meta-analysis published in the Annals of Internal Medicine that inappropriately combined studies done in widely disparate populations using different methods to suggest that saturated (“bad”) fat does not increase the risk of coronary artery disease. “The meta-analysis had mistakenly combined studies that did not fit together,” says Dr. Barnard. "The studies canceled each other out, and the faulty conclusions in the meta-analysis were widely reported as exonerating ‘bad fat.’" The meta-analysis was also cited by the 2015 Dietary Guidelines Advisory Committee. The following year, a Gallup poll registered a sharp decline in the number of U.S. adults limiting fat in their diets. Other tainted systematic reviews and meta-analyses have been used to make cholesterol, tropical oils, and overweight appear benign, serving the interests of the food industry. The commentary recommends several procedures to give meta-analyses a more solid foundation, including requiring review by editors with expertise in meta-analyses, requiring authors to confirm with the authors of the original reports that their data were appropriately represented, and carefully checking for conflicts of interest. “Because meta-analyses influence health policy, carry considerable weight in the media and in public perception, and have the potential to do harm, the peer-review process must go beyond ensuring that standard meta-analytic procedures have been followed,” the commentary concludes.